Hape have a wide range of wonderful wooden toys that inspire play, learning and exploration of the world. I absolutely adore Hape toys and think they are ideal gifts for children as they are bright, colourful toys that develop children’s play and imaginations. The Hape Scoot Around Rider is another fabulous gift from Hape that any young child would love to receive. This rider encourages little ones to take lots of short rides and helps develop their muscle strength and balance. Young children will love racing around on this rider and as it is foot-powered they have control of how fast they go. As they grow in confidence they can increase their power and the distance they ride. When assembling the rider the first thing I noticed (and loved) was its bright green colour. This vibrant mixture of shades of green is perfect for little ones and will brighten up any room. I found the rider very easy to put together and thought the bike was very sturdy, a great feature if children are going to ride on it. 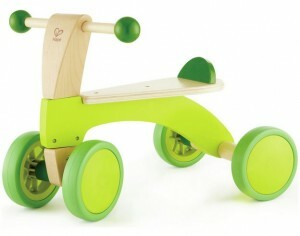 It also has wide wheels to aid balance and easy grip handles that are perfect for little hands. The Hape Scoot Around Rider is suitable for children over 12 months and is the perfect gift for the summer as little ones will love riding around outdoors on this fantastic rider. The RRP for the Hape Scoot Around Scooter is £44.99 and it is available from Argos.